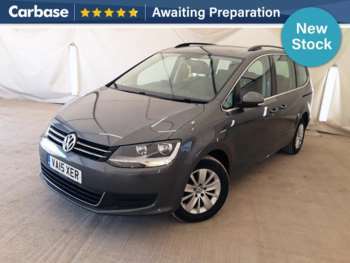 The Volkswagen Sharan is one of a triumvirate of MPVs sharing the same platform and numerous components, the others being the Ford Galaxy and Seat Alhambra. 1995's Sharan came with a 2.8-litre V6 from the Golf VR6 and another VW unit for a 90bhp 1.9-litre diesel turbo. 1997 VW added a 110bhp 1.9 TDi model to the range and a V6 Synchro with 4WD. The following year brought a new 1.8-litre 20v turbocharged petrol unit and then in 2000 the Sharan received some timely refreshments in the form of updated styling front and back, an updated interior to include seven seats as standard and an extra engine option, the 115bhp 'Pump Duse' diesel turbo. 2002 saw the arrival of a bargain, entry-level SL Sharan and 2003 saw a new 130bhp 'PD' diesel. Further restyling in 2004 was complemented by the standard inclusion of front and rear parking sensors. By 2006, VW had dropped the thirsty V6 petrol unit and the 130bhp 1.9-litre TDi in favour of a more refined 140bhp 2.0-litre TDi version. VW impressive BlueMotion technology was added to the Sharan in 2008 for a more economical drive. One of the main features within the Sharan is seating flexibility. With five or seven-seat options, all passenger seats can be turned, folded or completely removed for countless seating permutations. The modern dash is very smart, with silver rings around the blue backlit instrument dials, a beefy four spoke steering wheel and a number of useful storage cubbyholes. These later models also benefit from more comfortable seats, six-speed gearbox, air conditioning, electric front windows, remote central locking, alarm, roof rails, four airbags, ABS, electronic engine immobiliser, trip computer, power steering and a reasonable cassette radio. The used VW Sharan is one of those MPVs that, pleasantly, handles like a car despite holding the shape of a van. It's stable around corners and newer Sharans deal very well with poor road surfaces. The older models are good, but the Sharan has only improved with age. Any second-hand Sharan is impressively accomplished and practical. Got a specific Volkswagen Sharan model in mind?